As we enter the 21st century in an age when technology knows no bounds, the staff at Wm Olds & Sons Pty Ltd in Maryborough go about their daily task of producing engines and parts for state-of-the-art machinery using the tried-and-true methods of our forebears. Tradition combines happily with contemporary at Olds, the result being a small business that is big on production. From stirrups to components for aircraft engines, propellers for fishing and tourist boats, and carburettors for antique Oldsmobile Cars, Peter Olds and his team continue to turn out first class products for local industry as well as many state, national and international companies. Just this week, they have completed a consignment of special bearings for use in a Central Queensland Coal Mine. They continue to fill orders for bronze components for the Cairns Tilt train and other products for the electrical industry. 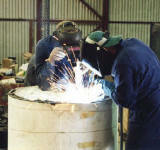 Olds also manufacture the castings for Bundaberg's Jabiru aircraft engines. It has been said that Olds is the largest manufacturer of aluminium stirrups in Australia. The latest consignment is now on its way to Melbourne. Peter Olds said their range of products is practically endless. "We make street furniture including modern and heritage litter bins, propellers, various bearings, head lights and other electric train components, QR coat hooks, luggage brackets for Gold Coast trains, and even grab handles for the backs of seats on the Darling Harbour trams. "That's diversity for you," Peter said. "The biggest single railway order that we've had was for head light assemblies for Newcastle's Goninan designed and manufactured NR series diesel electric locos. "These units can be serviced from inside the cab while the train is moving. The crews do not have to exit the cab to replace a lamp." Each Olds-made product is stamped with the distinctive Olds name but it is hard to say just where in the world they will turn up. "The French rail firm Railtech is a buyer of our alloy steel Straight Edges. They are manufactured for use when welding rail joints and we know that one batch went to Hong Kong for the tramway system." Peter said they get a lot of unusual and awkward jobs such as a recent request to repair a penny-farthing bike. The bike has generated a lot of interest amongst the staff particularly for its rare Lucas Patent No 2493 head light attached to the axle inside the front wheel. Peter said tradition and experience were the success of the business. 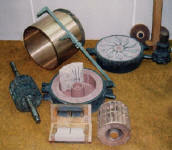 Some of the methods used by his father, William, when he started the business about 80 years ago are still being used.